My husband and I love going out and doing stuff just as much as the next person but sometimes our favorite thing to do on the weekend is try out new recipes, curl up on the couch and watch bad scary movies. Since we finally were done with all the bedroom projects and we got some snow, that’s how we spent this past weekend. My husband came up with this recipe to try and they were SO good. The best part is that this recipe is incredibly easy and super cheap to make… just two potatoes made everything you see above (minus a good amount that we ate while we were making them, lol). 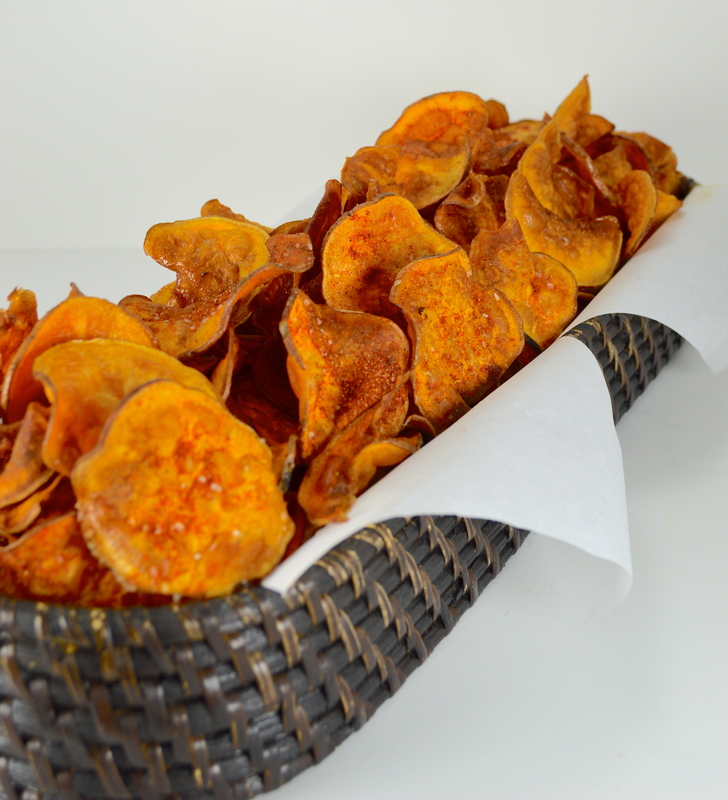 The coolest part is that you can make these ahead of time and eat them whenever you want… they’re also a unique alternative to plain old potato chips! Start off by heating up a couple inches worth of vegetable oil in a medium sized pot (1). You want to allow the oil to take it’s time, so I use medium heat… if you try to do it too fast it won’t hold at the right temp (375 degrees) and the chips will burn. This part takes some time but it’s well worth it in making the perfect chip plus you can do all your prep work while you’re waiting! 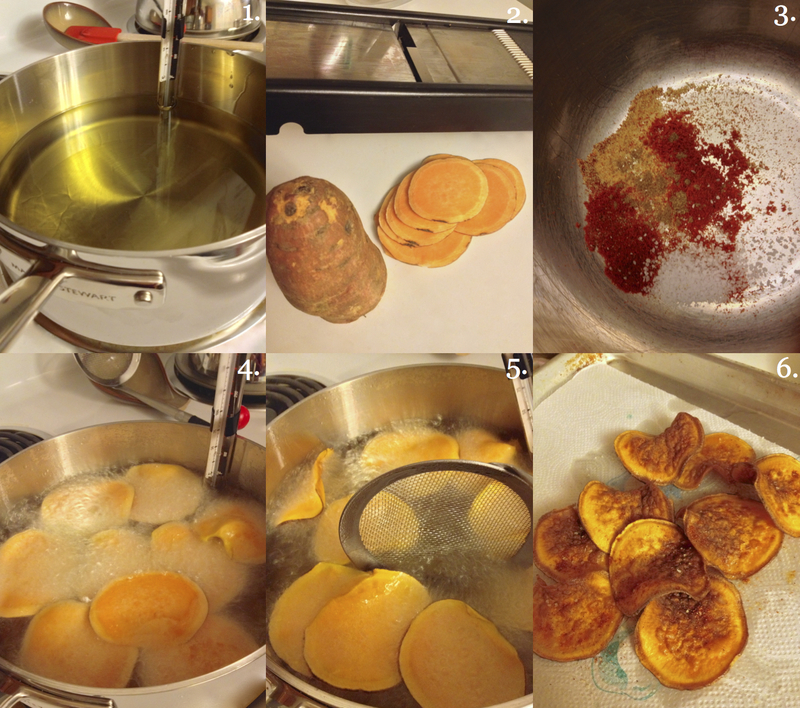 Cut two large sweet potatoes about 1/8″ thick on a mandoline slicer (2). In a bowl mix together 1/2 tsp ground cayenne pepper, 1 tsp chili powder, 1/2 tsp garlic powder, 1/2 tsp smoke paprika, 1 tsp sweet paprika, 1/4 tsp cumin and 1 tsp kosher salt (3). Once your oil is at 375 degrees and holding steady at that temp, drop in a handful of your potato slices (4). Use a spider to flip the slices and stir them so that they don’t stick together (5). Once the edges have curled slightly and they are a golden brown, carefully remove them and transfer to a paper towel lined baking sheet to cool. As soon as they’re on the baking sheet, sprinkle with some of your spice mixture (6). Allow the oil to come back up to temperature before starting your next batch and repeat! These look so yummy!! I am going to have to try them out. Those look fantastic – what a great colour! I want to get a mandoline but I’ve heard horror stories involving finger tips (or…lack thereof) Are they actually not that bad? Do you have one company you’d recommend? You should definitely get one there’s so many things you can do with them! We make shaved salad, our own hash browns, it makes making gratins a breeze, etc. I had the same fear before we got ours but after doing lots of research we figured out it was more human error than the mandolin itself. Most come with a hand guard, so you put the food in the prongs on that and there’s no way you can cut yourself. We have an Oneida, it’s inexpensive but works wonderfully, here’s the link: http://www.bedbathandbeyond.com/product.asp?SKU=15938390. They give it that kick that takes something great and makes it even better! I don’t have a mandoline either…but I do have a gift card to bed, bath, and beyond!! : ) Sweet potatoes are one of my favorite foods, and these look delicious! Sounds like a perfect time to get one then! If you do, you’ll love it we use ours so often!